At this time of year, after the dark days of winter and hearty food, I start craving nettles. They are said to be a blood cleanser and general spring tonic. They have long been used in herbal medicine and are meant to be helpful in easing or curing arthritis, asthma, bladder infections, gout, kidney stones and many other ailments. Luckily, spring is the ideal time to pick nettles; you want them young and tender. Just pick the tips (top 4 leaves). If you go out foraging for nettles, do try to pick them off road so they’re not polluted. Away from dog activity would be good too. I’m a bit of a wuss and require gloves when picking nettles. I’ve been stung by them too many times. But CT does the manly thing and plucks them with his bare hands. The theory is, if you grasp the nettles firmly, they won’t sting you, especially when they’re young. Usually, I use nettles to make soups. Nettle soup is one of my favourite soups at this time of year. Or, I use them as a general spinach type substitute in all sorts of dishes. I’ve never eaten them raw before though – until now. I was a little tentative when taking the first sip. What if the stings were still active? But not at all. It was beautifully smooth. The spring tonic nettle smoothie has a slight metallic note and tastes like it’s good for you, but it’s by no means unpleasant. I shall most certainly be repeating the experiment. A dairy free, creamy green pick-me-up smoothie that makes the most of spring foraging and will leave you raring to go. 750 ml coconut milk (or milk of your choice). Place everything in a power blender and whiz at high speed for 20 to 45 seconds. Serves 2 in 500ml glasses, 4 in 250ml glasses and 8 in 125ml glasses. If you fancy buying a Froothie power blender, please do so using this link Optimum 9200*. It’s currently on offer at £329, normal price £429. Any purchase made includes a one month money back guarantee, including postage and a six year warranty. Thanks for visiting Tin and Thyme. 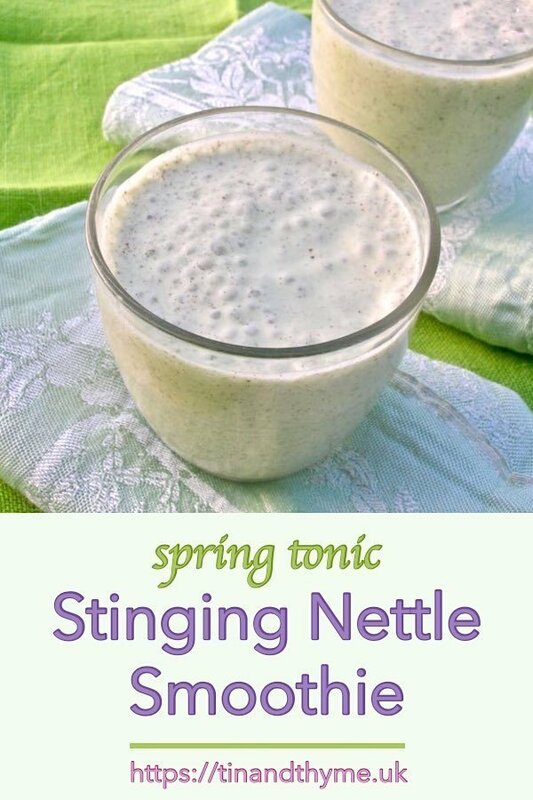 If you make this spring tonic nettle smoothie, I’d love to hear about it in the comments below or via social media. Do share photos on social media too and use the hashtag #tinandthyme, so I can spot them. For more delicious and nutritious recipes, follow me on Twitter, Facebook, Instagram or Pinterest. 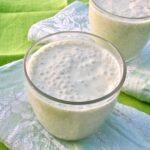 Spring Tonic Nettle Smoothie. PIN IT. This post contains affiliate links to Froothie Optimum products*. Links are marked with an *. If you buy through a link it won’t cost you any more, but I’ll get a small commission. Thank you for supporting the brands and organisations that help to keep Tin and Thyme blithe and blogging. I’ve never used nettles in cooking before but I’ve heard they are good. I am loving your recipe and the new blog. Looking good! Jac, cooked nettles are delicious and so good for you too – just make sure they are young and tender. Ive never heard of using nettles in cooling before either! Im intrigued. Nettle soup is one of my favourites Sarah – well worth trying. Intriguing! I bet this tastes fantastic. I will have to keep an eye out for the nettles growing! Never used nettles before, but you have me intrigued! We had soup last night with most of them Kellie, I just saved a few for this morning. Nettle soup is one of my favourites, but I use them for virtually anything you’d use spinach in. Pesto is an interesting one as that’s raw too. Gosh Christine, nettles grow pretty much everywhere, it shouldn’t be too difficult to find some – or at least they do here in the UK. Yes, the nettles are starting to grow already, we have plenty of them on the farm! I made a quiche with nettles last year and it was great, just like spinach. I’m hoping to do more nettle cooking this year and loved the Nettle and lemon cake I saw posted recently. Your smoothie looks very healthy and a simple way to get some greens. I made nettle and lemon cakes last year Janice and they were great. I amazed everyone with the green colour and kept them guessing as to what was in them. Loving the new look blog, looking forward to seeing your expanded range! I like the sound of this, especially if it gets rid of some of the nettles. I love nettle soup too. Hi Louise, nettles are a wonderful food and make a great substitute for spinach. The sting disappears as soon as it’s cooked and nettle soup is one of my favourites. 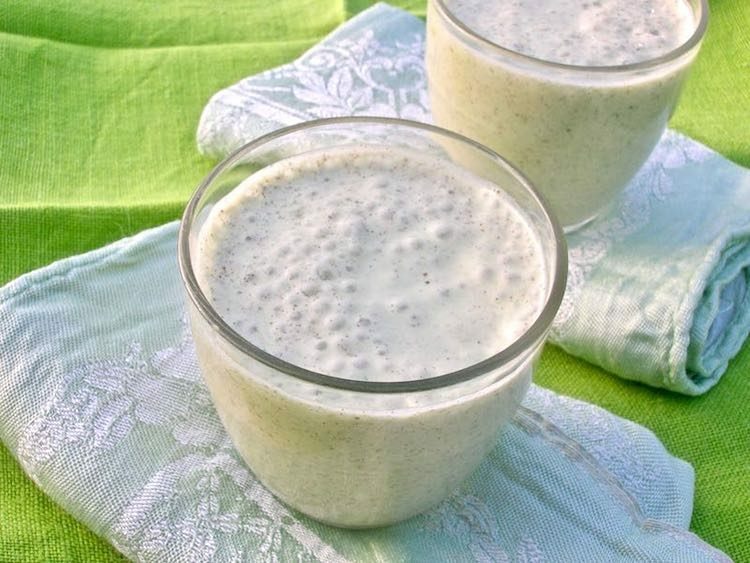 I wouldn’t try this smoothie until you’ve tried cooked nettles – the taste is much more pronounced. It’s a fab idea and I’ve never thought to try nettles before, seems like a great use of them! It is indeed Olivia. Not only are nettles full of good things, they are also very tasty. I would try them cooked first before going for a full on smoothie though. If you’ve never had nettles before Laura, I’d go for having them in a soup or some other cooked dish first. If you’re used to adding kale and other greens to smoothies, though, this should be fine. I pick nettles with gloves too. Never tried them in a smoothie tho, might just give it a try as we have so many nettles growing here at the Kitchen Shed at the moment. Nettles, I find are one of those plants that are never very far away Sarah! Let me know how you get on. I have a mostly hate hate relationship with nettles, arising from a motorway incident some years ago (suffice to say, stuck for hours, no facilities nearby, hardly even any bushes on the very visible road side, got stung to all hell when taking advantage of the one (thorn-covered) bush I could find). I ought to try them edibly, just to get my own back — my fingers were swollen for days, and I was stung all up my legs and um, arse! Oh dear Kavey, that doesn’t sound like a fun experience at all, no wonder you’re not keen. Definitely worth trying to get your own back I reckon. Thanks Ren, so pleased you like it. It still has lots of work to do on it, including the header, but it’s getting there. Pea shoots sound quite delicious. I will try those when (and if) ours get planted. Loving the Optimum 9200 and I’m using it all the time. I’ve had nettle soup before and it was quite nice, wouldn’t have thought to use them in a smoothie though, nice idea and glad to hear they didn’t sting! Haha, I was rather glad about that aspect too Jen.